Lyrebird Youth Choir is now welcoming high-school-aged singers of all voice types and backgrounds to participate in an exciting 12-week season of making music, building friendships, and growing together at Chanson Voice & Music Academy. Our program will draw from classical, contemporary, and folk traditions. Our weekly rehearsals will culminate in a community concert as well as informal, optional performance opportunities. Registration is open for our fall 2018 season and we invite applicants to register for a five-minute audition to be held Sunday, September 16 between 6 and 8 p.m. The choir will rehearse weekly, Sunday evenings, 6 to 8 p.m., from September 23 through December 2, culminating in a concert on Sunday evening, December 9. Tuition for our fall season is $175 per student, due upon acceptance. Payment plans and limited need-based scholarships are available upon request. Email lyrebird@chansonvoicestudios.com for more information. 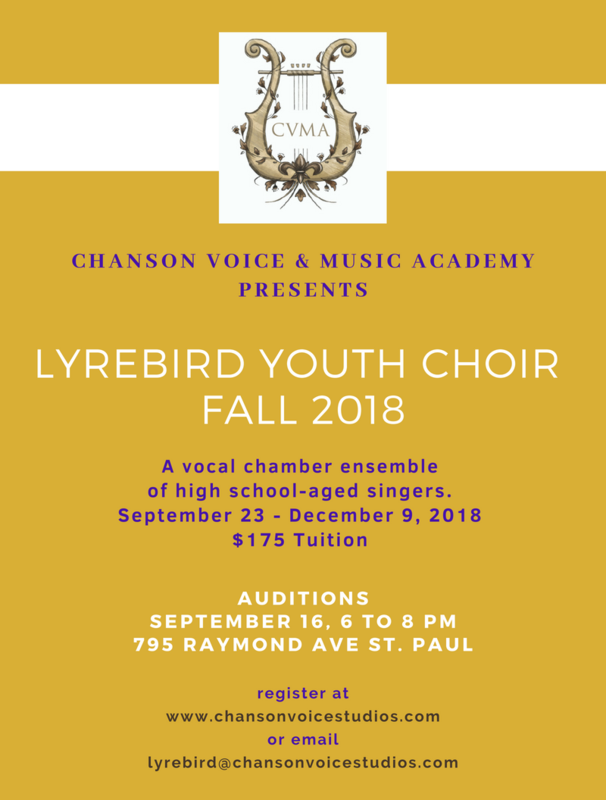 Lyrebird Youth Choir is an auditioned vocal chamber ensemble of select Twin Cities high-school aged singers. We are passionate singers striving for mastery in the joy-making work of singing together. Lyrebird Youth Choir will explore a program of fun modern and traditional repertoire, carefully chosen by our director for pedagogical value and musical potential. As we embark on our musical journey, we will advance our skills as singers, learn about our voices, create community, and grow as an ensemble. We will produce a concert for the enjoyment of our friends, family, and community, and for our own musical satisfaction. Learning to succeed in a collaborative endeavor will require that singers attend weekly rehearsals as each individual’s growth and expression is essential to the success of the group. Additionally, all singers will be offered one private lesson with the director during the semester, which is included in the tuition. We look forward to joining our voices with yours! To register, please fill out the online form, linked above. An email confirmation will be sent within 24 hours and a five-minute audition time slot will be assigned on a first-come, first-served basis. Singers will be notified of acceptance the next day, Monday, September 17, and rehearsals will begin the following Sunday, September 23. Email lyrebird@chansonvoicestudios.com to request an application. Registration: Fill out our online form to join! Tuition is $175. Limited scholarships are available. Read about the Director, Tom McNellis here.